Hawaii County can stay in the driver’s seat of the Keauhou aquifer — but the reprieve is only temporary and comes with conditions. After nine hours of testimony in Kailua-Kona on Wednesday, the state Commission on Water Resource Management delayed making a decision on whether to put the aquifer under its control. Instead, the body opted to extend an investigatory period until the end of May. In the meantime, the county and the National Park Service must collaborate to try to find alternatives to a state designation for the water source. The Hawaii County Department of Water Supply must also provide the commission with an outline of how it plans to replace water sources, add transmission lines, improve infrastructure and make sure wells are properly spaced to reduce the risk of them taking too much water from around Kaloko-Honokohau National Historic Park, which petitioned last year for state control of the aquifer. The Hawaii Department of Health was hoping that outgoing Gov. Neil Abercrombie would sign new rules into law before he left office Monday that would help phase out thousands of cesspools throughout the islands that could be contaminating coastal waters with raw sewage. The proposed rules would ban new cesspools and require property owners to convert cesspools to septic tanks within a year of a home or building being sold. But the governor did not act on the rules, a department official confirmed Monday. They now go to the desk of the new governor, David Ige. That, said Sina Pruder, chief of the state health department’s wastewater branch, could delay or derail implementation of the regulations that the department has been working on for more than a year. Signs warn the public to keep out of the water at Kahaluu lagoon. A spokeswoman for Ige indicated over the weekend that the issue is not likely to be addressed immediately. Hawaii’s cesspool problem has gained increased urgency with recent health department findings that Kahaluu Lagoon leading into Kaneohe Bay is contaminated with bacteria associated with human sewage. Bacteria levels in some areas around the lagoon have registered as high as levels detected in the Ala Wai Canal in 2006, after city officials dumped 48 million gallons of raw sewage into the waterway because a pipe burst in Waikiki. Health officials suspect that close to 700 cesspools in the Kahaluu watershed, which isn’t hooked up to the city sewage system, could be causing the pollution. The health department has posted signs warning people to stay out of the water, while health officials continue to investigate the source of the pollution. 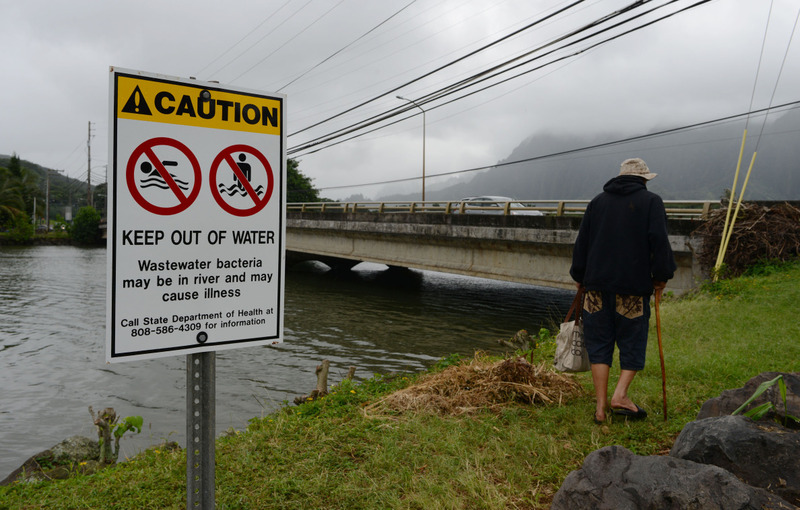 Over the years, the health department has been particularly concerned about the impact that cesspools are having in Waimanalo Beach Lots, Hanalei Bay on Kauai — where cesspools are located along the river that feeds into the ocean — and Kapoho on the Big Island, said Gill. Essentially holes in the ground that discharge raw, untreated human waste, cesspools have been phased out in many states throughout the country, according to the U.S. Environmental Protection Agency. Hawaii has continued to permit the systems and has the distinction of having more cesspools than any other state — about 90,000 throughout the islands. More than half of the systems are located on the Big Island.